At Strictlymarketing we stumbled across this article from Future Food, Australia’s Global Food and Hospitality Consultants and could not help but share it. It is so interesting to explore how we could reinforce the success of brunch in our marketing campaigns and through our retailers. Brunch was traditionally a family Sunday meal designed to bring everyone together and eat a wholesome, comforting meal in each other’s company. Whilst it is still designed to bring everyone together, brunch has been transformed into a meal that is far more elevated than it’s former self and for some, the most important dining out experience they partake in. According to The NPD Group’s latest market research, brunch is currently the most popular day-part for not only full service restaurants (FSR) but quick service restaurants (QSR) and retail as well with it experiencing a 12% visit growth across all sectors in 2017. And a similar trend is being experienced globally with more people looking up places to eat brunch on Google than ever before. First thing is first, it’s important to know who is driving this trend. The Millennials have been the key group to push the brunch revolution and they’ve done so for a number of reasons. Firstly, they consider dining out to be a key and valuable part of their lives. Regardless of income (which is lower than their predecessors due to their life stage), this population group are happy to invest in a meal on a weekend morning, generally with friends and they generally spend much more than they would when making breakfast at home because it’s important to them. Cultural researchers have asked why and explanations stand that this age group entered the work force during a recession meaning they have a different set of priorities when it comes to how they spend their hard-earned money. They want to spend it on experiences, not material items. They also grew up in a time where the world was transitioning to digital and everything around them was becoming connected, but not on the personal, face-to-face level humans so deeply need. To correct this, socialising and having space to do so outside the home is key for their lifestyles. Lastly, they have continually asked for innovation to keep them engaged in a world where they can access everything at their fingertips which for the hospitality industry, has caused a shift away from traditional menu items and from the structured 9-to-5, breakfast, lunch, dinner towards something much more fluid to allow food operators more opportunities to showcase the ‘new and exciting’. 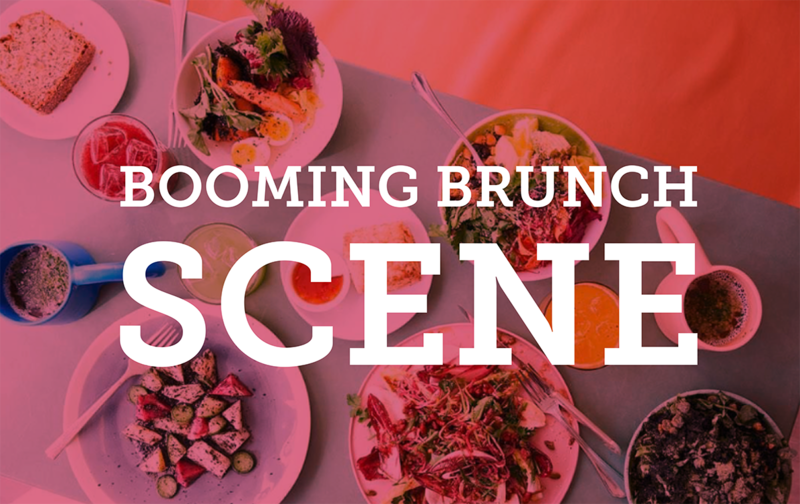 With all of these factors combined, brunch is the perfect opportunity for these foodies and their younger followers, Gen Y and Z to hit their sweet spot. Brunch is known for it’s social sense. Cafes on the weekends are packed with tables of friends and family, crossing stories and sharing intimate time together. This still happens in other day-parts as well but brunch offers a much more casual experience (as opposed to a full-service dinner, lets say) making it appealing and very accessible – a socialising activity that can be carried out every week. This is very important to note as it’s all the younger generations that are needing this type of social interaction. Recent research on Gen Z has shown that they will favour food outlets that provide space for them to casually relax and enjoy their time with friends, connecting and socialising rather than a place that limits this behaviour. Brunch might be a more casual experience but that does not mean to say that the food is unexciting, in fact it is much the opposite these days. Cafes who are embracing the brunch menu are exploring food far beyond the breakfast menu to the point where your meal you get with your fresh orange juice and coffee could have also been dished up at one of your city’s best restaurants. This level of menu innovation is capturing the experience economy who want more from their spend and continually strive to find the next best thing. Soaked muesli is now a ‘superfood seed breakfast bowl with freeze-dried fruit’, a bacon and egg roll is now a ‘brioche bun with coffee-rubbed Wagyu and pickled zucchini’, pancakes even got a makeover with countless operators dishing up colourful, extravagant towers of fluffy hotcakes that you won’t be able to resist taking a photo of. And you can expect to pay between $20-$30 for your meal so whilst the food is innovative and exciting, the price point tends to match the casual experience rather than the high end one. This makes having brunch approachable, affordable and enjoyable in the eyes of the consumer. The success of brunch spots and the love Millennials and younger have for them does not have to be exclusive to this day-part so as food operators or precinct masterplanners, we do need to consider the success factors of brunch and tactfully apply them to other concepts or spaces. From our perspective, the key successful aspects of brunch include a casual yet inviting environment, a menu that announces excitement the moment the customer opens it and a spend bracket that is not too high, not too low but just right for a relaxing yet sophisticated dining out experience. These factors are suiting our population right now as people seek more physical connection, more space to relax and tune out and more experience from their spend.